There's no shortage of highly-capable medical staff at VA Hospice in Salem, Va. to ensure that dying veterans and their families are cared for and comfortable. But one of the facility's most effective caregivers actually has no formal training. His name is Tom, and he's a cat. Palliative care coordinator Dorothy Rizzo rescued the friendly orange tabby from a local animal shelter four years ago, thinking that having a cat around would make vets feel more at home during their final days. 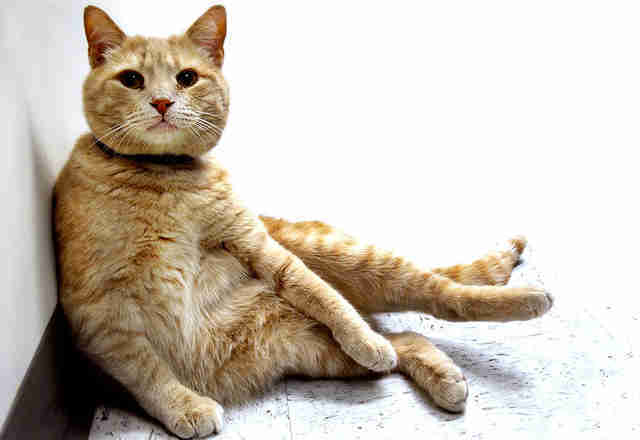 But Tom soon proved to be something far more than a feline; he became a source of happiness for folks at a time when that feeling seemed remote. In those moments when a patient could use a companion, or a vet's family has gathered to bid farewell to their loved one, Tom can often be found strolling into service, offering comfort through gentle interaction. "Tom has known what to do since the first day he was here," Rizzo told Veterans Affairs news. "There's something about the presence of an animal that has a calming effect. Watching the cat or petting him takes you out of the sad moment you're in." During his tenure at the hospital, Tom demonstrated an uncanny sense of knowing when a patient is nearing the end, making sure he's there to snuggle next to them as they take their final breaths. But the cat's comfort is as much for families as it is for the vets themselves. When World War II veteran Edwin Gehlert passed away at the Salem VA recently, the orange cat was there by his side, sharing the sad moment with serviceman's family. Gehlert's widow Elizabeth told the Richmond Times-Dispatch that, just by being close by, Tom helped shift the mood from mourning the loss of the vet to celebrating his life. "My husband had a beautiful passing because of that cat," Gehlert said. "I had such joy in my heart." 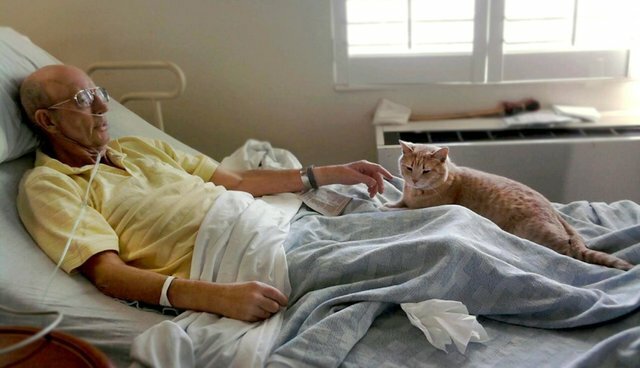 The VA hospice's resident psychologist, Betty Gillespie, describes how cats like Tom can be the best medicine during times of great sadness. "Families often feel helpless. You're watching your loved one die and you know you can't save them. Sometimes you can't even talk to them, or wake them up. All you can do is watch and wait," says Gillespie. "But Tom provides you with some comfort; he's something for you to focus on. Because when a tabby cat casually walks into the room, it sends a message that everything is OK, everything is as it should be. Tom's like a good piece of music. He instantly connects with everyone in the room." And there's science to back up Tom's role at the hospice clinic. Studies have found that cats can reduce blood pressure in patients, while also reducing their fear and anxiety - making those final moments of life more comfortable simply by being there.